Line a loaf pan (8 ½ x 4 ½ inches) with plastic wrap, so that extra wrap extends over the edges. You’ll need the extra wrap to cover the cookie dough as it chills in the refrigerator. Set aside 36 pecan halves. Place remaining pecans in a food processor, fitted with a steel blade. Chop pecans until they are coarsely ground. Add flour and powdered sugar to the processor. Pulse on high until mixture is thoroughly combined, resembling dry crumbs. Add butter and vanilla to the processor. Pulse until mixture combined. It will be crumbly. Press the cookie dough evenly into the prepared baking pan, allowing air pockets to settle. Use an angled spatula to smooth the top of the surface. Fold extended plastic wrap ends over the surface of the shortbread dough and seal it tightly. Set the loaf pan in the refrigerator to chill for at least 30 minutes, preferably for several hours and up to two days. Preheat the oven to 350º F. Line a baking sheet with parchment paper or aluminum foil. Remove the pan from the refrigerator. Unwrap the plastic wrap and lift out the firm loaf of cookie dough, placing it on a cutting board. Use a long bread knife to cut the shortbread lengthwise into two logs. Then cut each of the two logs into ¼-inch slices. Set the shortbread slices onto the prepared baking pan. 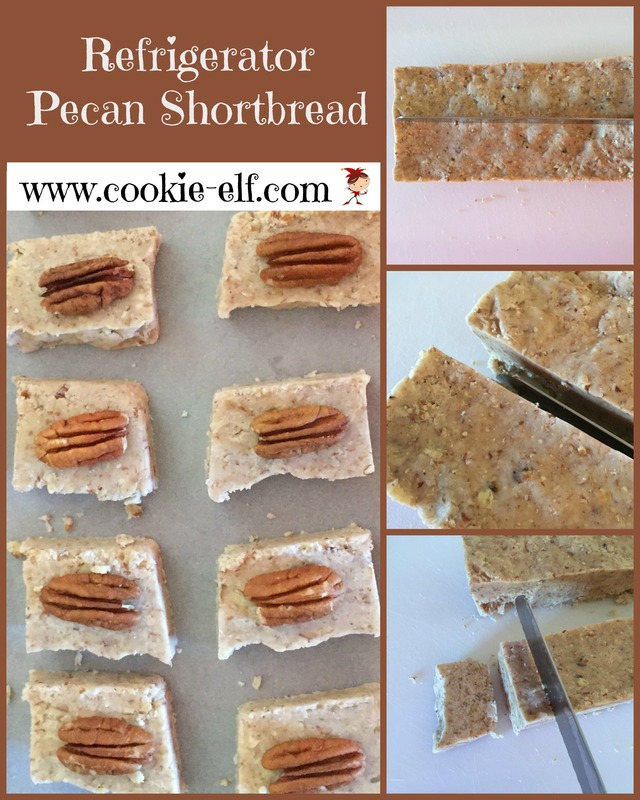 Press a pecan half into the center of each slice. Bake shortbread for 15-20 minutes just until edges begin to brown. Remove the pan from the oven. 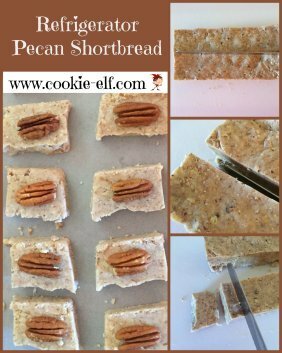 While shortbread is still warm and soft, touch the tops of the pecan halves to press them more firmly into each cookie. Let shortbread cool completely. Remove the shortbread slices from the pan and store them in an airtight container with waxed paper in between layers. You can double this recipe. Divide the prepared dough in half and chill it in two loaf pans. Cut logs two at a time to get evenly-sized shortbread slices. See more easy shortbread recipes on our Shortbread Pinterest board.